Thank you all for your kind words about my painted kitchen cabinets! I was a little scared to admit I didn’t paint them all white, after professing my love of white cabinets all these years! Yet I’m very happy with how things are coming together. I’m also very excited to show you the rest of the kitchen because then you can get the FULL picture, as there are definitely more elements and colors than what you’ve seen so far. I’ve received quite a few questions on kitchen cabinet colors and several of you are still deciding what to do with your own cabinets. 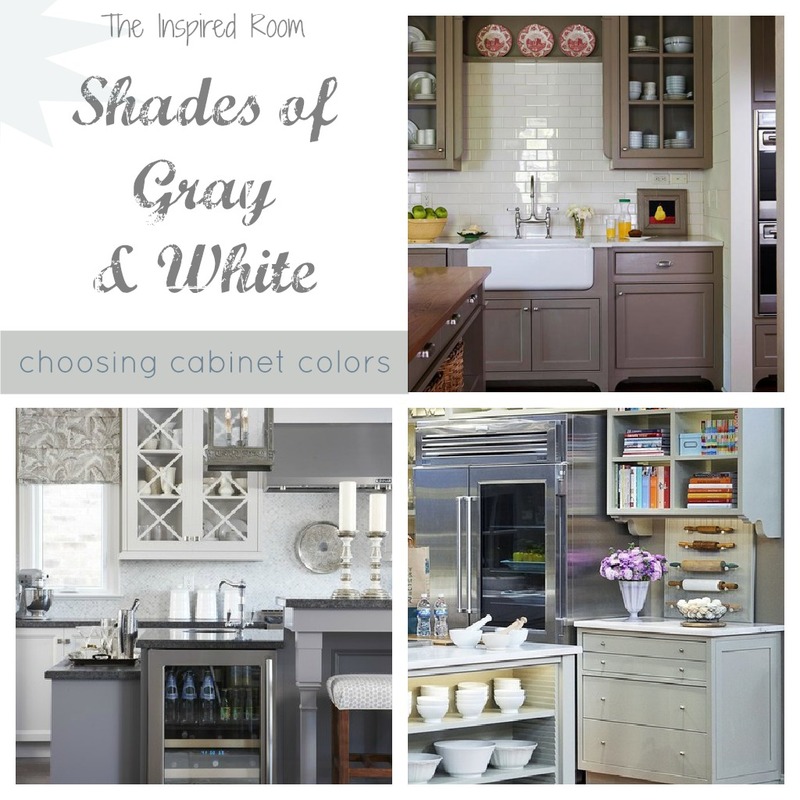 So, I thought I’d give a little more detail on how I chose my cabinet colors and a few tips to consider when designing a kitchen color scheme. 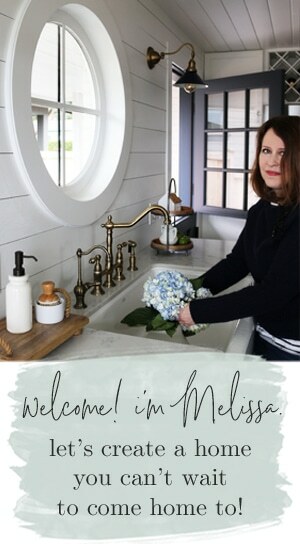 I went through this same process with the other kitchen makeovers I’ve done, so hopefully it will help you too. While going “all white” is a popular choice for kitchen cabinets, there are so many color options for cabinets that can also provide beautiful results. 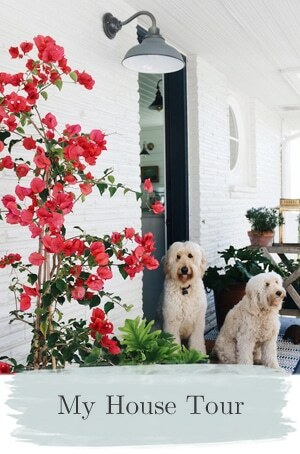 And some might even be better for your home than all white! 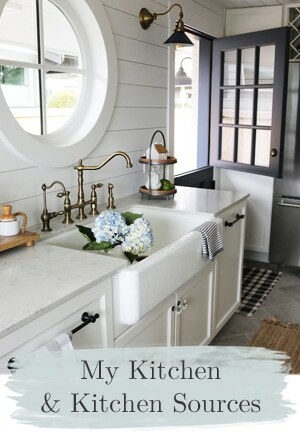 Of course, I’ve always been a white kitchen lover (my last kitchen was a soft antique white) but I definitely think you can branch out from white cabinets if you want to and still have a gorgeous kitchen that will feel every bit as “white kitchen dreamy” but perhaps with your homes unique personality or existing elements mixed in!. 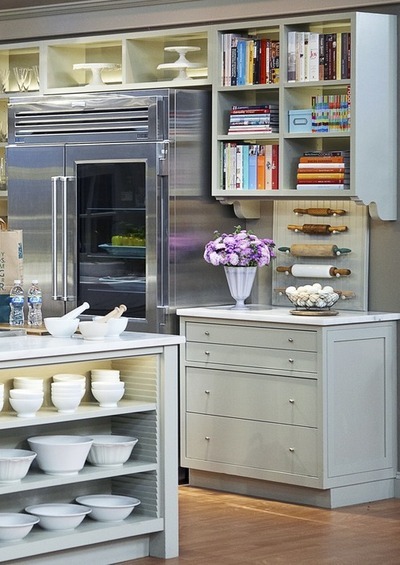 Personally, I can love just about any kitchen that has a beautiful blend of a few key foundational items. Just like I can love so many styles of homes and decor. It is more about the mix of elements in a space than any one style or color. How you mix those elements in your own kitchen will depend on your taste and home. Thirty years ago my mom had our lake house painted in shades of gray and white, including the kitchen. I loved that combination then, and love it now. 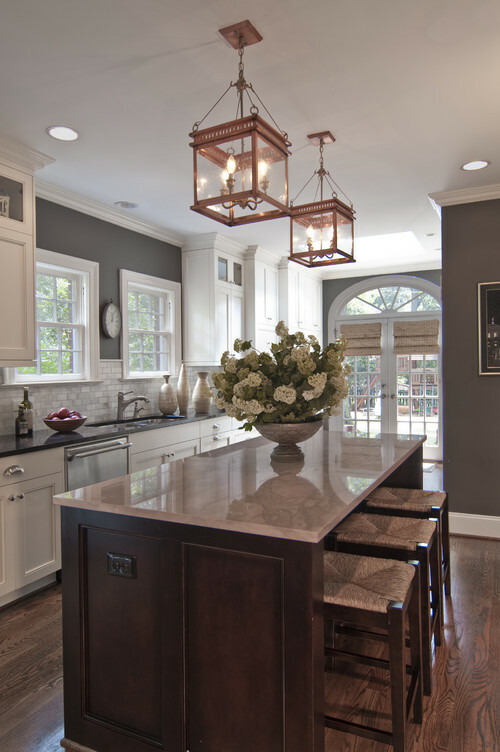 Neutrals are always up to date and classy and well suited to many kitchens. Variations of white or gray kitchens don’t go “in or out” like some people fear, it is how you mix elements together with your chosen color scheme that will end up giving your kitchen the timeless but still current look most of us probably want. 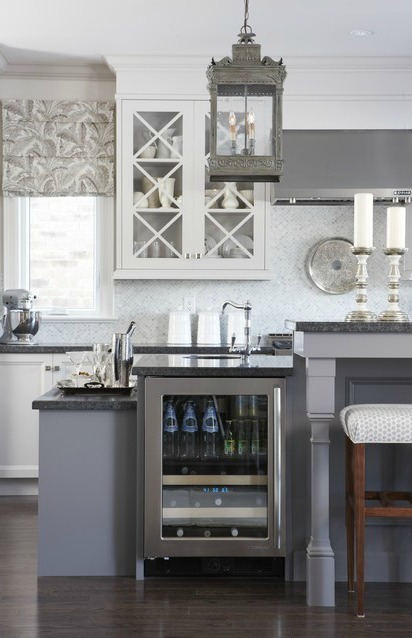 Plus, neutrals (like any shade of gray, tan, black and white) are so easy to update with your favorite colors, fabric patterns or trends so they make great choices for cabinets. Honestly, I have not found any color that DOESN’T work with my new cabinets, which really has me excited about seasonal decorating too! I can add aqua, red, green, yellow….so many options for accessories! 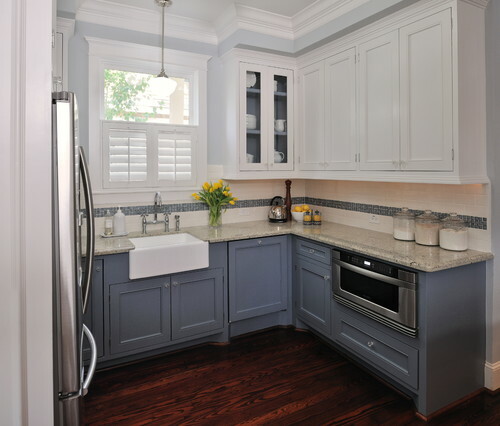 Of course, some kitchens look fantastic with colored cabinets. Each kitchen is unique. When you are planning your kitchen, it’s helpful to think of the room as more complex than just a paint color scheme you like or a single element. While white cabinets are lovely, they are not the only way to achieve a pretty kitchen. In fact, you can actually have a boring white kitchen, so it isn’t the white alone that magically transforms a space. It’s those layers and combination of elements that make a room come to life! 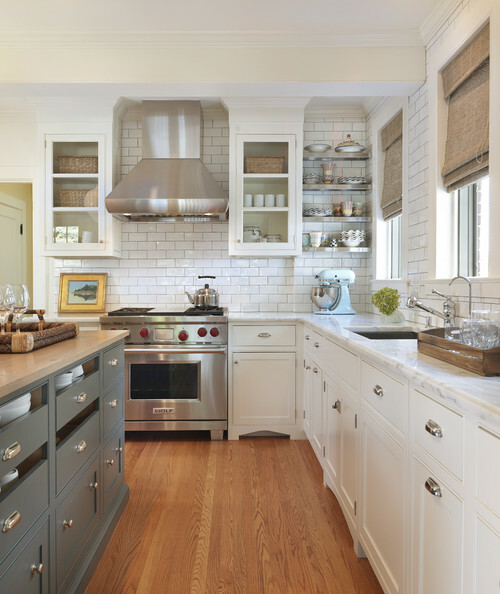 Your cabinets or kitchen walls might need more vibrant color to bring personality or interest, or your architecture might be beautiful on its own, so white or neutrals are the best compliment. You might really love white kitchens, but decide like I did to go with white walls or counters to achieve the white kitchen look, rather than white cabinets. There are just so many ways to design a pretty kitchen and still get the overall look you love. So how did I decide what color to paint my cabinets? 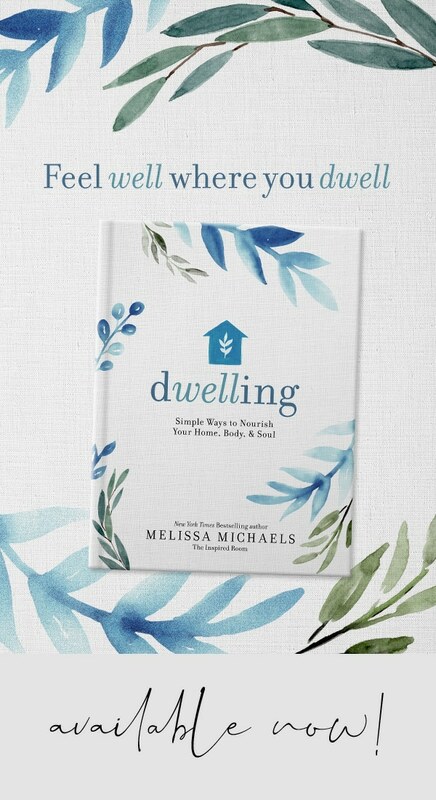 If you want more detail on how I made my decision, this section is for you! I know this is a long post, but you can skip over this if you just want to look at the pictures! Or if you need to refresh your memory on what my cabinets look like, you can revisit that kitchen cabinet post. I wanted a more custom feeling for our kitchen since everything previously in our kitchen was pretty much the standard builder choices for a house like ours. We weren’t remodeling the entire space, but for the things that were changing, I had options. I especially wanted simple white counters and white subway tile. White subway tile was affordable (and I wanted a lot of it), timeless and would add just the right amount of texture and light and wouldn’t compete with our floors. The white counters would feel clean, uncluttered, reflect light and be a very pretty backdrop for accessories. I had gorgeous wood counters in my old house that I loved, but now we have beautiful wood floors that fulfill that need for wood texture. I didn’t think wood counters or all wood cabinets would be as effective in this kitchen (although we are still using some wood furniture). If you have a strong feeling about one or more elements (other than the cabinets), or if you have elements that you are not changing (such as flooring!) you can use those as your starting point for design. So, after considering the elements that mattered to me, WHITE counters and subway tile were my first choices in the kitchen. After those choices were made, I could think about cabinet colors. 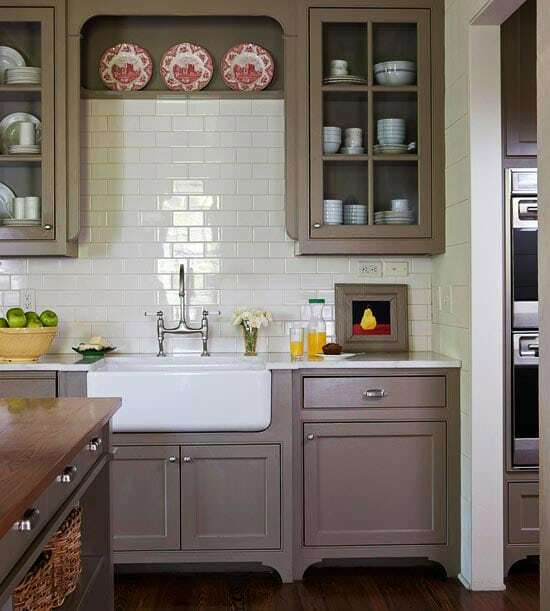 Gray green cabinets are lovely, and I painted cabinets in one of my houses with a grayish shade of green, but in this house I felt like green would be too “cabin-y” with my rustic wood floors. So green was a no. Yellow cabinets would have not contrasted well with my floors. Red would have been too much for my eyes. Teal or pale gray or soft blue cabinets would have felt too wimpy or “cute cottage” for my Craftsman style house, we needed a little more depth of color. Black was too harsh in big doses with the floors, and brown would be kind of “meh” with the floors. I like my walls in the kitchen family room to be a soft gray so I wanted the cabinets to be darker than the walls. PHEW! So many thoughts went through my head! But that is how I narrowed it down! 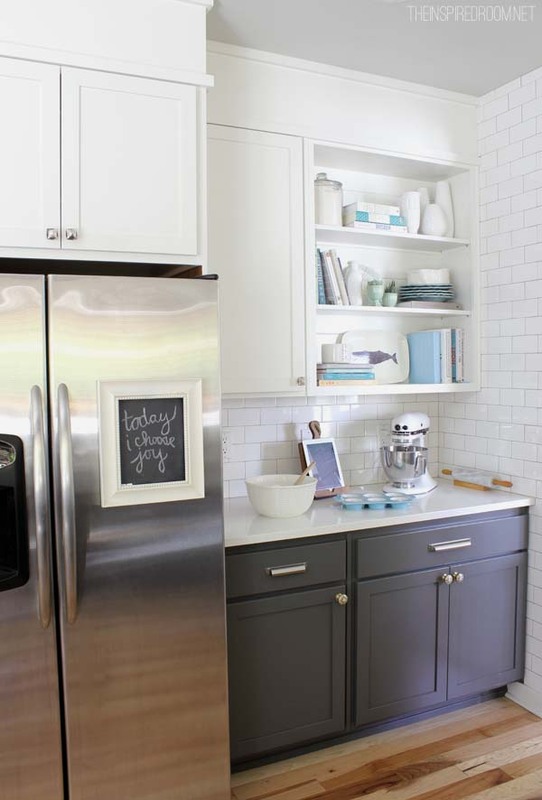 Once the counters and tile were decided and other cabinet colors ruled out, it was also pretty clear that white cabinets would have been a little overkill with the white subway tile and counters. I didn’t want a clinical feeling kitchen. I definitely wanted more contrast and interest to please my eye when I walked in the room. The white subway tile wall would bring a lot of light, so I wanted the contrast of dark to balance and calm the room a bit. Lastly, I wanted to have a slightly modern vibe to my kitchen (it is a newer house), even though we were giving it some old world character by using some classic elements such subway tile, a goose neck faucet and an apron front sink. 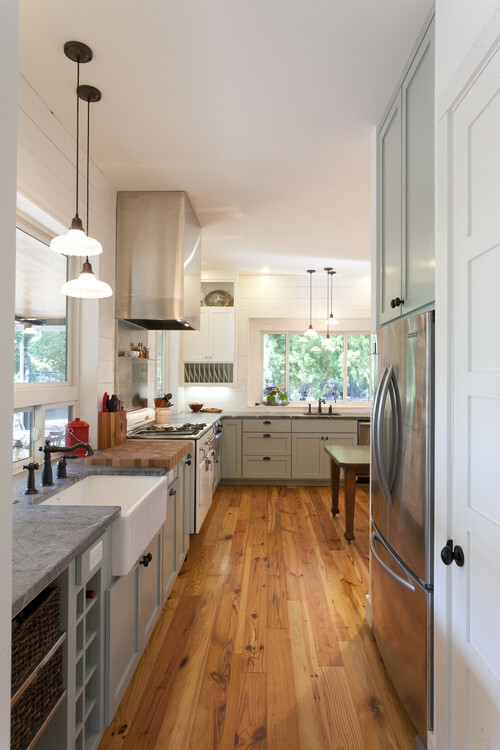 A deeper gray just seemed timeless, like the best of both old and new world style and the perfect combination to balance out the rustic floors. And to appease my white kitchen love, and to give a little more variety and interest to the cabinets, we painted the few upper cabinets we have white. So with the white upper cabinets, white plank walls and white subway tile, essentially our kitchen work area feels quite light and white, even with the gray cabinets and some soft gray walls. The floors add so much warmth. I find it to be a very light, clean, soothing and calm feeling space. 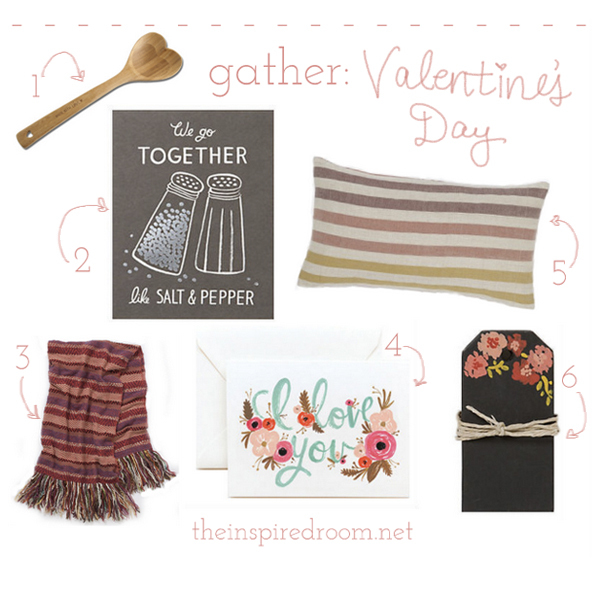 Of course, there are more elements in our kitchen you have not seen yet! 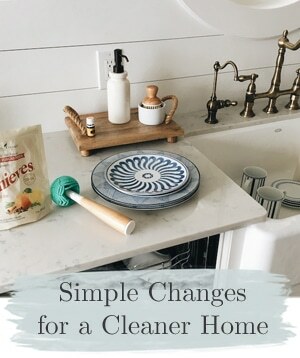 You’ll see what we chose for a couple of SUPER CUTE ceiling fixtures, my DIY makeover of our island (YEP, I’m DIY’ing), a rug and seating area in the kitchen, as well as other ways we are bringing color and pattern to the room! I’m happy with the mix! Every kitchen is unique. There are many elements to consider but once you get the right mix, your kitchen can be gorgeous no matter what color cabinets you end up choosing! 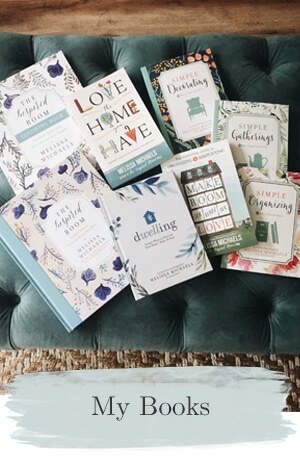 gathered by Courtney Michaels, a interior design intern at Maison Luxe in Seattle.